0 Comments Published by Cedric Benetti on Wednesday, October 3, 2007 at 10/03/2007 01:02:00 AM. This saturday, Paris and Barcelona will host their march for the rights of transsexuals. 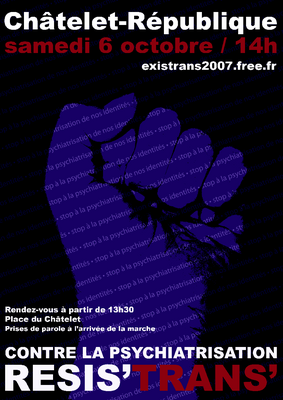 The 11th "Existrans" march will start at 2 PM at Chatelet, and will be headed for Place de la République. The transgendered community aims to raise the standard of the medical care that transexuals receive. The march is organised by the Association Syndrome de Benjamin (ASB) which helps transexuals receive the correct medical and psychological support. Please join in the crowd and show your support this saturday! PARIS FASHION WEEK! It*s here! Weeeeeee!